An easy-to-use homework management system which integrates online assessment with your XYZ Textbook and MathTV.com video tutorials, for an integrated course experience. 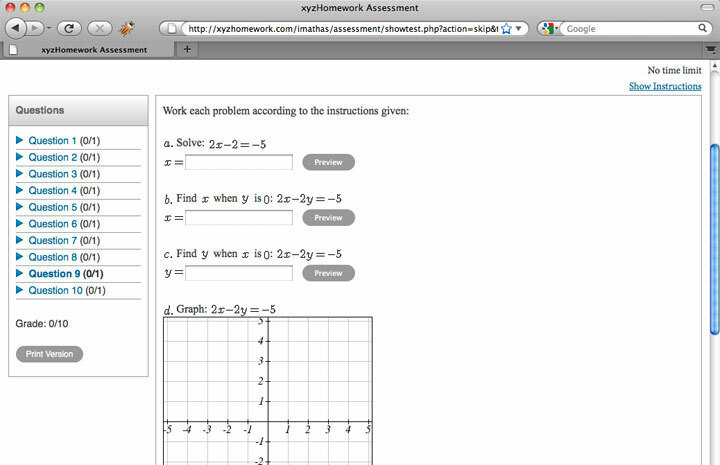 XYZ Homework provides powerful online instructional tools for faculty and students. 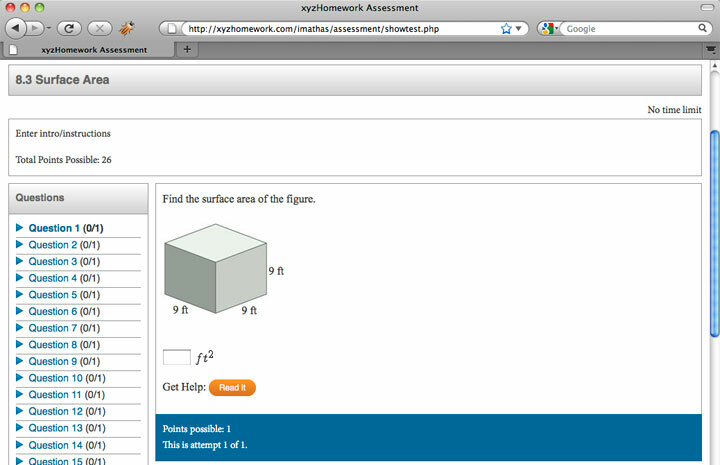 Our unified learning environment combines online assessment with MathTV.com video lessons, and works in conjunction with each XYZ Textbook to reinforce concepts taught in the classroom. Randomized questions provide unlimited practice and instant feedback with all the benefits of automatic grading. When students purchase any textbook directly from XYZ Textbooks (print or ebook), they automatically get an All-Access Pass, which includes XYZ Homework at no additional cost. It's easy to get started with XYZ Homework. There are over 4,500 randomized developmental math exercises, which correlate section-by-section to selected XYZ Textbooks. From these questions, ready-to-use assignments have been created to get you up and running quickly. 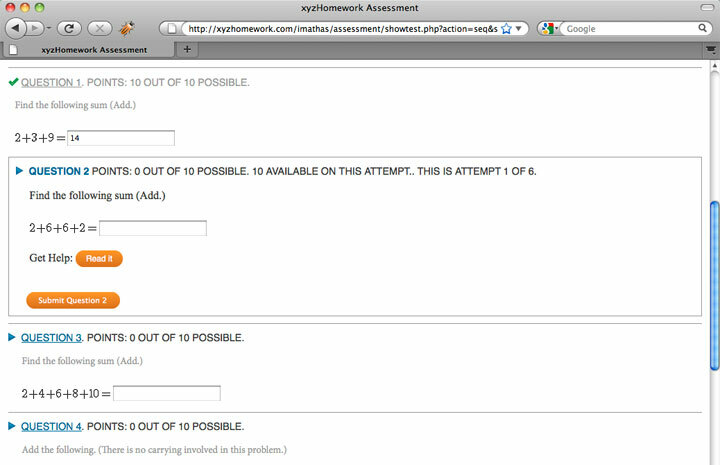 XYZ Homework is completely self-sufficient. There's no software to install, servers to manage, or databases to maintain. You and your students get a complete hosted system with real-time functionality that is available around the clock. 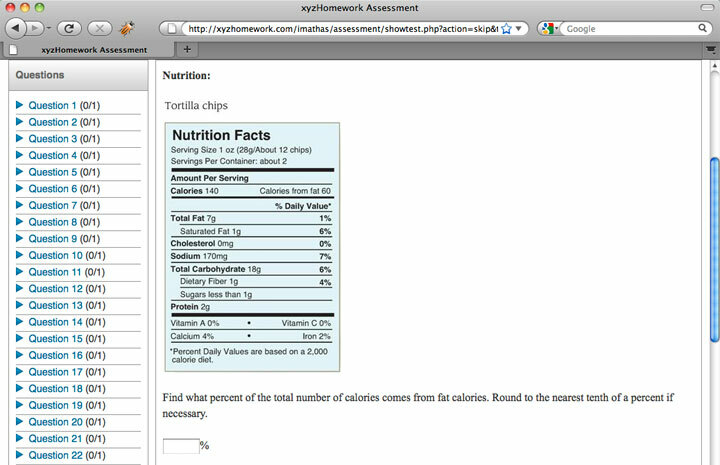 XYZ Homework has an easy-to-use automated grading system to grade homework and calculating weighted averages. The gradebook updates automatically as students complete assessments, and allows instructors and students to track their grades at their convenience. If you need to have your grades entered in another system, then simply use the "export" settings in the gradebook. It will create a .csv file (comma-separated values) that you can open in any spreadsheet program, and you may be able to import it directly into your other system as well. 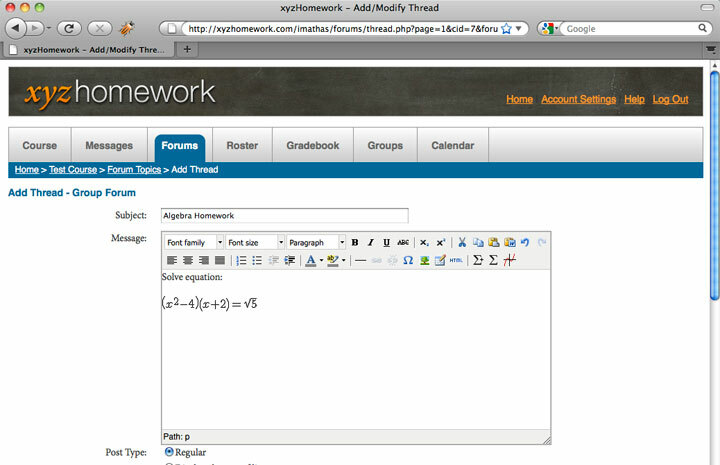 XYZ Homework is powerful enough to function as a simple, self-contained LMS. It allows you to easily distribute handouts and worksheets to your students, and there's a course calendar for you and your students to keep track of all upcoming assignments and tests. XYZ Homework has communication tools that include proper mathematical notation, to make it easy to "talk math" with your students. You can easily send mass messages to the whole class or more personal messages to particular students. XYZ Homework makes it easy to share homework assignments, sets of questions, or even entire courses with your colleagues. If your instructor is using XYZ Homework and has supplied you with a Course ID, head over to xyzhomework.com to login and enroll in your course.